The hall echoed with yells, scraping skates and sticks smacking the ice as 12 young hockey players raced around the rink. Hoping to reach pro-level speeds upwards of 50 km/h and shots reaching over 160 km/h, the players skated at breakneck speed, passing the puck to open teammates while avoiding hits. The goalie used acrobatic feats like splits to defend the net from groups of players taking multiple shots. Welcome to the Okanagan Hockey Academy, where young hockey hopefuls hone their skills, attention and lightning fast reflexes with the skating speed to match – and it does that all not in Manitoba, Winnipeg or Ottowa, but St. Pölten, Lower Austria. While of course skiing remains the winter sport of choice for Austria, hockey is second only to football as its most popular team sport and has a history in the Alpine republic, which fielded its first national team as Austria-Hungary in 1912 and is currently ranked 17th in the world by the IIHF (International Ice Hockey Federation). Surrounding countries like the Czech Republic and Slovakia have fared even better, producing players that compete at the highest level, like National ­Hockey League (NHL) goalie legend Dominik “The Dominator” Hašek and Marián Gáborík, a forward with the Los Angeles Kings who was the third draft pick overall in his rookie year. Austria also has its share of NHL players, with Thomas Vanek of the Detroit Red Wings leading the pack. A fifth overall draft pick for the Buffalo Sabres in his rookie year, good overall performance makes him a desirable regular season player; but he is known for lackluster playoff appearances, most notably with the Montreal Canadiens in 2014. However, Vanek is one of only three Austrian players in hockey’s highest league, forming 0.3% of the overall player base according to QuantHockey.com. The Czech Republic and Slovakia contribute 3.6 percent and 1.4 percent, respectively. The biggest talent pool remains Canada, with a share of 47.7 percent of all current rosters. It is no wonder then that a successful hockey school in Austria is run by Canadians. The Okanagan Hockey Academy Europe is part of a larger Canadian training program that routinely turns out minor league and NHL players. With schools in Canada, the U.S., England and Austria, as well as camps all over the world, the Okanagan Hockey Group is one of the larger international private training programs. It is also the oldest training camp in the world with over 50 years experience. The idea behind the first school in Canada (2002) and the St. Pölten site (2008) was to “give families the opportunity to combine hockey development with academics in a preparatory school environment,” Vorlicek stated. Hockey is only one part of a larger program aimed at creating good citizens with well-rounded academic backgrounds. To support a high level of academic achievement, the St. Pölten academy has partnered with the Lower Austrian International School to offer the Austrian Matura and the International Baccalaureate program (IB). 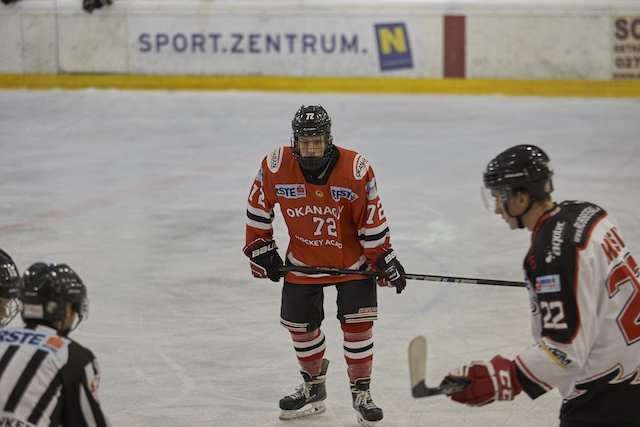 A collection of fortuitous circumstances made St. Pölten the ideal site: Time on the ice is at a premium in Vienna, both in terms of availability and cost, but rinks were more readily accessible and less expensive in the smaller capital. Additionally, “the city was building a large sports gymnasium at the time, next to a boarding school,” according to Vorlicek; as such, there are training facilities for a variety of sports and athletes as well as convenient housing. The professional prospects of the students vary. Some get drafted to European leagues like the Erste Bank Eishockey Liga (EBEL) the Austrian top division, equivalent in prestige to a minor league in North America. Okanagan has also worked with partners in the U.S. to set up a team in Boston to provide exposure and scouting opportunities for colleges. Several students have traveled to the United States to play on athletic and academic scholarships. 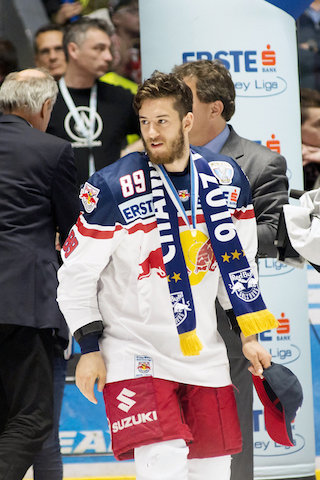 As the academy is merely eight years old and has only had four graduating classes, the careers of some of their students are still unfolding; five graduates are currently playing for EBEL teams. Former student Florian Baltram, a native of Vienna currently playing for Salzburg Red Bull, remembered his time at the school fondly, citing the flexible organization of academia and sports as the major draw for him: A player does not “have to miss any practices because of school”. He continued with praise for their training program and opportunities: “You have great coaching staff there and you really can improve your game. The coaches also make you aware that there are different routes in hockey,” emphasizing that further post-secondary education is always an option. In the future, Vorlicek would love to see a women’s team formed at the school. However, there are many steps between now and a time when hockey becomes popular enough within Austria to support a new team. Vorlicek and the school have partnered with others across the country to start minor and children’s leagues to provide player development and increase the popularity of the sport. Skiing may always be king of the hill in Austria, but if Vorlicek has his way, hockey might well rule the ice when temperatures drop and football goes into hibernation – just like in Canada. Jennifer Cornick is a contributor to METROPOLE and avid reader. When she isn't writing, she can be found in Vienna's English bookstores.